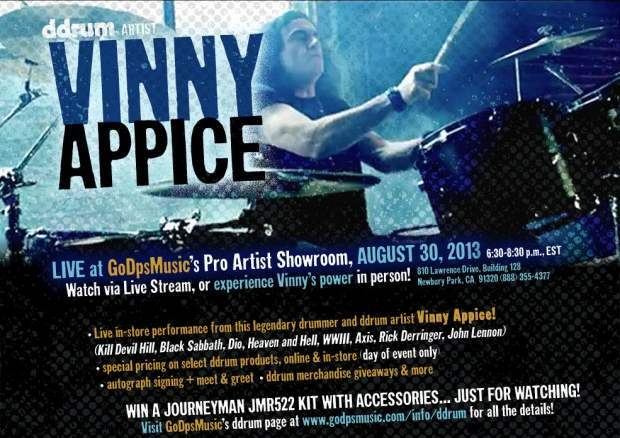 Video footage Vinny Appice's (DIO, BLACK SABBATH, HEAVEN & HELL, LAST IN LINE, KILL DEVIL HILL) August 30 drum clinic at GoDpsMusic in Newbury Park, California can be seen below. Vinny Appice has anchored the rhythm and power live and in the studio for the music of DIO, BLACK SABBATH, HEAVEN & HELL, WWIII, AXIS, Rick Derringer, John Lennon, and more. He has recorded and co-written songs on over 25 albums and CDs, including many multi-platinum records. Touring the world for over two decades resulted in selling millions of records! Vinny's drumming can also be heard on numerous movie soundtracks, including "Wayne's World 2", "Heavy Metal", "Iron Eagle" and "Bedazzled". Vinny, the author of drum instruction book "Rock Steady" and DVD "Hard Rock Drumming Techniques", has performed incredible powerhouse drum clinics around the globe. Numerous books have been written about BLACK SABBATH and DIO with the authors always mentioned Vinny's unique powerful drumming style.